Broken and burned windows are seen after a fire broke out on the 50th floor of Trump Tower on April 7, 2018, in New York City. 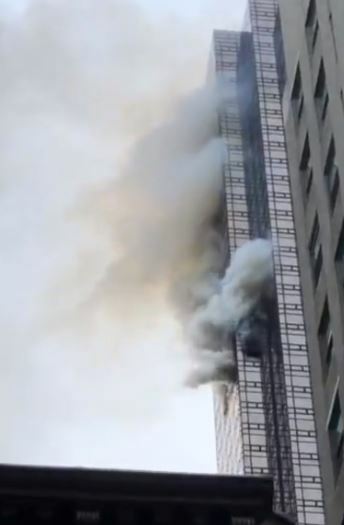 NEW YORK - An elderly man died late Saturday after a blaze erupted on the 50th floor of Trump Tower in New York which also injured four firefighters, officials said. The New York Police Department said the 67-year-old man was found "unconscious and unresponsive" when officers arrived at the scene of the fire. The man was pronounced dead after being taken to Mount Sinai Roosevelt Hospital, according to police, which said the medical examiner's office would determine the cause of death as part of an ongoing investigation. "This was a very difficult fire. As you can imagine, the apartment is quite large, we are 50 stories up. The rest of the building had a considerable amount of smoke," the New York City Fire Department (FDNY) said. It said the four firefighters had "non-life threatening" injuries and that the blaze had been brought "under control." Smoke began rising from the skyscraper in Midtown Manhattan around 6:00 pm (2200 GMT). Streets surrounding the building owned by US President Donald Trump that serves as the headquarters for The Trump Organisation and houses the president's penthouse were closed off as tourists snapped pictures on their phones. The FDNY earlier tweeted a picture of the building with several windows of the 50th floor ablaze. "Fire at Trump Tower is out. Very confined (well built building). Firemen (and women) did a great job. THANK YOU!" he said.